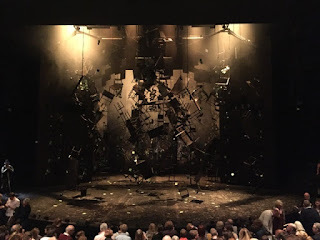 Last Friday night Stuart and I went to see As You Like It at the Olivier Theatre on London's glitzy South Bank. You'd think that staging a popular Shakespearean play would be easy to get right these days - especially at the National Theatre with such glorious talent on hand. Put up a basic set, add a few well known faces and away you go. But as we have seen with other recent Shakespearean West End productions it can be hard to pull off what people want now - a wow of a show. What with theatre prices rising at 5% in the last year audiences now expect something a bit special and so expectations run high. But you tinker with the classics at your peril. So it's a difficult balancing act to get right. Go for gimmicks or play it straight? But with this production we sure got our wow. The plot is the Bard's usual glorious confusion of star-crossed lovers, sibling rivalry, banishments and cross-dressing. And it was funny, well-acted and well-spoken. The modern dress wasn't too distracting and the human sheep a delight. So far so good. But what actually got our jaws hitting the floor was one of the scenery changes. The end of the initial scene is a modern day sweatshop/office with row after row of long tables, chairs and desks. As the scene ended and the actors left the stage we began to realise that all the furniture was actually chained together leg to leg by hidden links. Four huge hydraulic cranes were attached to four separate chairs within the set and at different parts of the stage. As each crane lifted a single item of furniture aloft so all the other items attached to it got dragging up high into the air in massive a daisy chain. A thunderous noise filled the room as the whole set got dragged this way and that until four enormous towers of jumbled furniture were suspended 20 metres above our heads. Each tower floated from the rafters down to just above the stage floor. The furniture was all black or dark brown and so each tower gave the impression of being a massive tree. Which sure enough was what the next scene was - a forest full of trees. It was brilliantly done and got a huge round of applause.